Even though my daughter bought my boy Odin when he was three days old, it did not stop me from shopping for him over the next 8 weeks until we picked him up. One of the things I looked long and hard at was a vest for him. 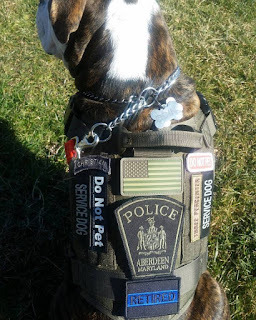 Even though there is no requirement to have a service dog identified by a vest, collar, or otherwise, it makes life a lot easier when they are. Even though Odin is a working dog, he is not searching warehouses on a midnight shift or fast roping off the Space Shuttle with SEAL Team 6. 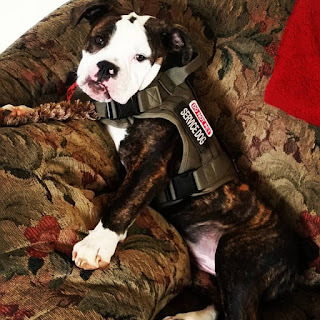 As a matter of fact, I don't need to attach his leash to the harness or typically even use the handle on the vest because we train like crazy and at 6 months old he is doing very well. I wanted something that was made well that had a bunch of Velcro on it for pimping out with patches from identifier panels and morale patches. 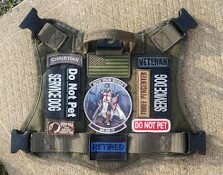 The Onetigris Military Patrol Dog Harness has the most Velcro that I could find, and interestingly enough, the Velcro is also on the MOLLE webbing so that you can choose to put patches over it, put MOLLE pouches on it, or place Velcro backed pouches on it. I thought that was pretty cool. hair bands to manage the webbing for a neater look. At the price point I have to admit that I was expecting something cheap but hoping for something inexpensive. I was actually quite flabbergasted when it arrived when I saw the quality of the vest. My first impressions were that the good materials such as fabric, hardware, and thread were fashioned into a fine piece of thought out gear with good sewing and attention to detail. Onetigris may be in China, and having only this vest to judge them by, it is better than some of the Made in the USA gear I have come across. Odin is now 6.5 months and 60 lbs. He grew into the size large vest adjusted to its smallest adjustment about 8 weeks ago. It has tons of strap left and he will be able to wear it when he is full grown at about 80-90 lbs. He is an Olde English Bulldogge and has a huge chest. This is one of the features I like most about this vest. 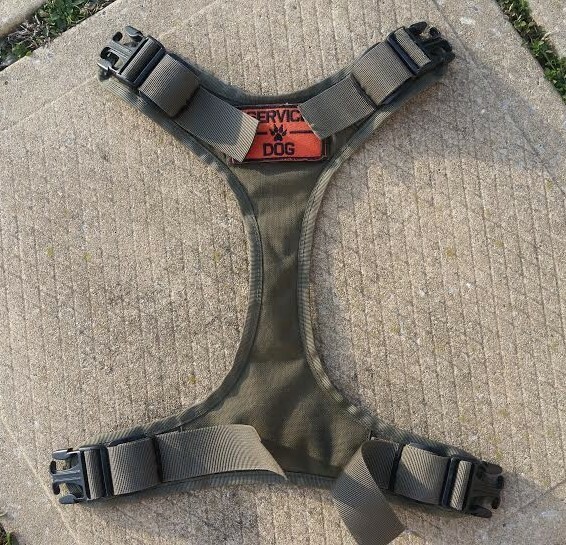 It features a "yoke" that runs all the way under the dog instead of three unconnected straps like some vests. I also like that this features a Velcro patch that I have used for a bright orange Service Dog ID. As a service dog, Odin is on the go more than a pet. On average a dog sleeps 80% of the day. This is not the case for a service dog. 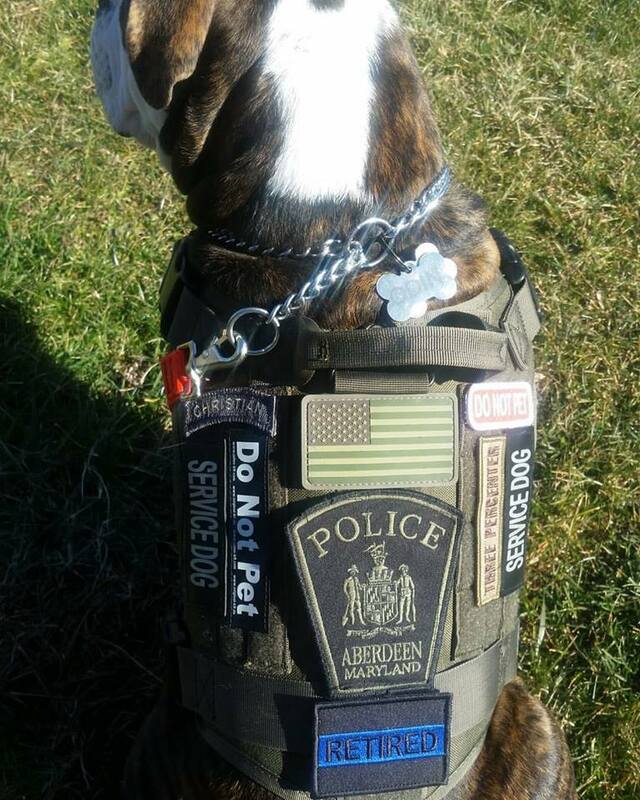 He is always on the move and wears the vest most of the day. Like I said earlier, I cannot speak for the strength of the leash attachment or handle, but I would not hesitate to trust them based on the quality of the vest. This is my first piece of gear from Onetigris but I will be checking them out more. 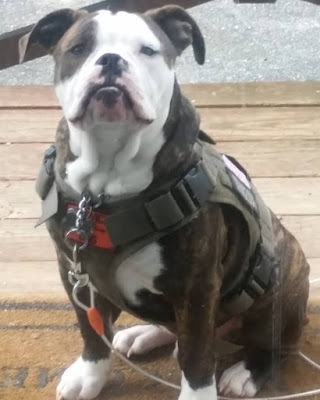 So, if you have a service dog or just want your dog to be tacked out because face it....its cool, consider checking the Military Patrol Harness.